This is a sample of some of the gas, water and drainage projects we have undertaken throughout the Midlands, London and the Home Counties. In order for Housing Associations to meet the new Lead Content In Water Guildelines, we replace many lead service pipes to older housing stock. Shallow trench excavating to install new water mains to sites around the country for the Canal and River Trust to ensure boaters have access to a clean water supply. 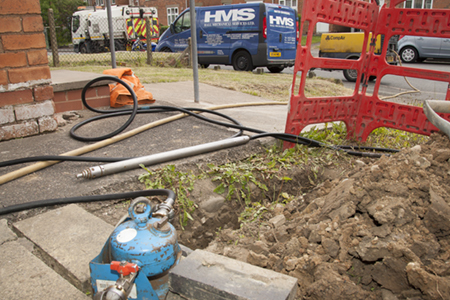 Trenchless moling to install new electricity ducts for the upgrade of electricity supplies to Housing Association properties in and around Worcestershire and the Midlands. Installing new gas supplies to rural properties. 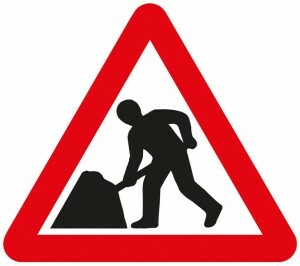 Some supplies need to be laid in a deep trench requiring mechanical excavation. Installing large diameter water mains to industrial premises at various locations in Worcestershire and the surrounding counties. Invariably these larger projects require a combination of mechanically excavated deep trenches and pedestrian shallow trench excavation for branch supplies. 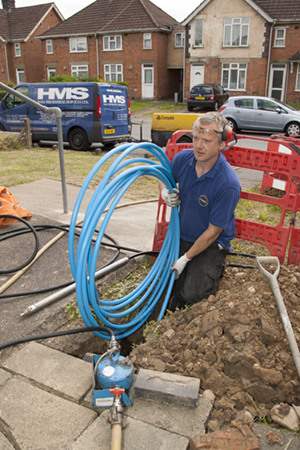 Call us on 01527 889580 or email keith@hmswater.co.uk for a professional and efficient response to your enquiry.